Josh Cohen, founder, and CEO of Junkluggers took a “garbage” idea and turned it into a business that’s booming. Starting a business is challenging, and when it’s a niche business, those intricacies become even more complex. Josh faced this challenge head-on when he took the mainstream offering of hauling junk and made it environmentally sustainable. And, to his credit, Josh has built a company with a great business model and such great values, that other people want to get in on the action. Fifteen years later, his specialized junk removal service is the fourth-largest in its industry with franchises all over the U.S.
Josh will be speaking at the 2019 Smart Hustle Small Business Conference about his Junkluggers story. He’ll also be talking about what it looks like to franchise a small business. The Smart Hustle Small Business Conference is an ALL DAY event you don’t want to miss! You'll find inspiration, excitement, and INFORMATION to grow your business all in one place. Find out more information here and register. This exciting one-day event is produced by entrepreneur and author Ramon Ray. This year, the conference will be held on December 5th, and with over 300 business owners and entrepreneurs in attendance, it’s a must-attend event! Don’t miss the opportunity to learn from the main stage speakers who are proven experts in their fields, about leadership, technology, marketing and so much more. Attendees represent a cross-section of industries such as business consultants, speakers; attorneys, accountants; financial consultants; health and fitness professionals; technology consultants; real estate agents and more. 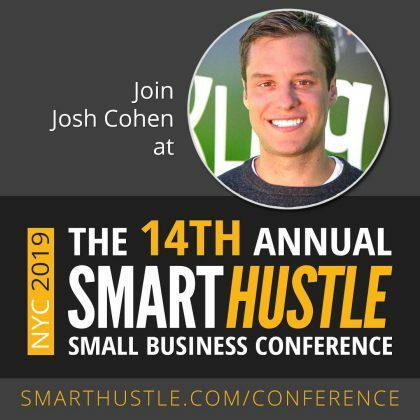 I hope you take this incredible opportunity to come learn from Josh and the other amazing speakers taking the stage at the annual Smart Hustle Small Business Conference.